With food samples there meet together main foods that are sold on the basement floor of a department store in Japan today. Our food samples are a messenger that has a fine, meticulous sense. 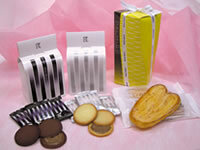 The picture at left shows those of food samples of Baumkuchen or tree-ring cake which is a confection representing the German confections. 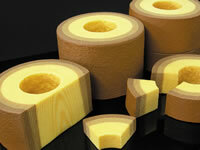 There are delicious Baumkuchen available everywhere in Japan too. Together with our technology our food samples have reproduced them realistically, according to the special device of each respective confectioner for taste and quality. As shown in the picture at left there are various food samples of baked confections like a cookie, a pie, a madelene, a finanche, and a gauflette. We express and reproduce our food samples such that a cookie or a pie will look crunchy and crispy and a madelene or a finanche will look moist as if its moisture spread in the mouth. The picture at left shows a food sample of well-chilled jelly a typical summer food in Japan. 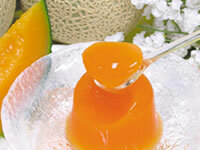 To produce its coolness, a food sample of jelly is reproduced in such a manner that a lustrous complexion is reproduced on its surface with expression of both crisp softness and clarity of jelly. 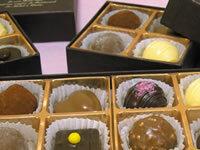 Contrary to jelly, food samples of chocolates are popular in spring, fall, and winter. Our food samples of chocolates express the quality, lustrous complexion, and feel of a chocolate bar, a fresh chocolate, or a chocolate powder used for coating a cookie. 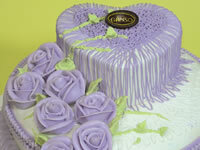 As shown in the picture at left, there are food samples of a one-bite size petit cake, a whole cake prepared for celebration, or a wedding cake served in a wedding ceremony. No food samples are impossible for us to produce, regardless of their sizes.